You're on vacation - take that extra half-hour. Block out your calendar for the week with nothing but the blissfully relaxing words, "lazy river." The indoor pool definitely has its perks. Feeling the aftershock of golf muscles you haven't used in awhile? Indoor hot tub awaits. Pour that first mug and head out to the balcony before anyone else is up, then tiptoe back in for refills. You're 3 miles away from Myrtle Waves Water Park. Enjoy a refreshing frosty beverage at the poolside bar. The nautical themed Bluegreen Vacations Harbour Lights, Ascend Resort Collection has a casual, sailing motif that leaves you looking for opportunities to use words like “Starboard” and “aft.” Don’t bother unpacking once you get to your condo, just get changed into swimsuits and get ready to hit the pools. There’s an indoor and an outdoor pool. Go for a swim or lounge with the latest issue of People magazine and a refreshing drink from the poolside bar & grill while the kids splash around in the children's pool. Enjoy a relaxing float down the lazy river. Get your workout on at the fitness center or rent bikes and wheel around the beautifully landscaped grounds. One- to two-bedroom condos sleep four to six guests. Full kitchens have what you need to whip up anything from sandwiches to multi-course meals. Bake your famous chocolate fudge brownies and allow the little ones to assist with the mixing (and the tasting!). Enjoy the brownies while you catch a Friends rerun on the Flatscreen TV with cable. Don’t worry if the kids ended up with chocolate on their clothes, that’s what the in-suite washer/dryer is for. Show off your multitasking skills and throw in a load of laundry while you’re watching the show. River Oaks Golf Plantation is a short drive from the resort, just toss your clubs in the car and go. Bed Bath & Beyond, Dillard’s and ULTA Beauty can be found at Coastal Grand Mall along with Cracker Barrel, Red Robin and Cinnabon. Get your caffeine fix at Starbucks. 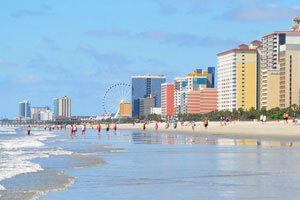 Enjoy the best views in Myrtle Beach on the SkyWheel. It’s almost two-hundred feet tall and the climate-controlled gondolas ensure that everyone can ride in comfort. Broadway at the Beach offers a variety of shopping and dining options. Little ones will love Build-a-Bear. They can be involved in every step of making their own stuffed animal. Find gifts and collectibles at The Mole Hole, get a new pair of flip-flops at the Flip Flop Factory. Pick up a souvenir for your four-legged family member at Reigning Cats & Dogs. Hungry? Extreme Pizza, Hard Rock Cafe and King Kong Sushi are just a few of your choices. Visit the 750,000-gallon shark tank at Ripley’s Aquarium. Ripley’s Odditorium has Robert Ripley’s (the creator of the Believe It or Not cartoons) personal collection of unusual and strange artifacts. Surprise the kids with a trip to the Children's Museum of Myrtle Beach. Interactive exhibits include The Big Bank, where little ones can pretend to be a bank teller or a customer, Water Works where they will learn about the Scientific Method and the Under Construction House where they can pretend to be a contractor.